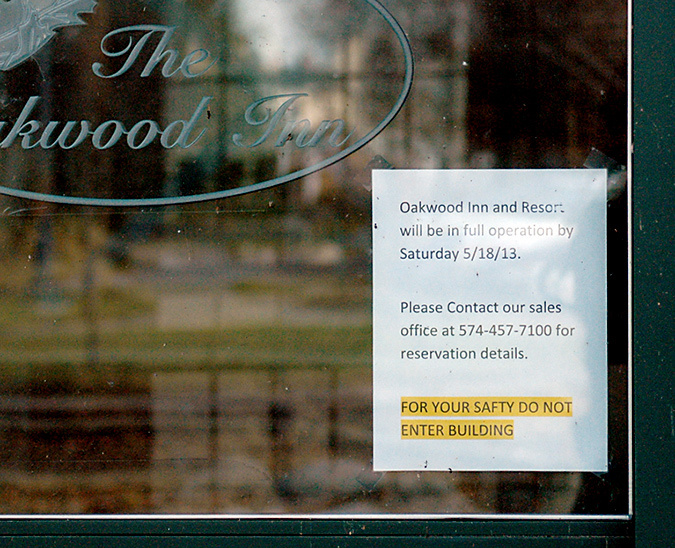 Notices recently went up on the doors of the Oakwood Inn announcing it will be open May 18. A phone number was also provided for those who want to make reservations. Ian Rolland, receiver for Oakwood, said closing on the property will take place between Dec. 15 and the end of the year. Meanwhile he has given the Parents latitude on getting the work done to meet their deadline. Rolland said the closing should be straightforward and both parties are waiting on technical matters such as final authorization of the Community Development Block Grant. Crews have also been removing dead trees on the property. The Parents brought in a tree expert who has identified a number of dead and dying trees, mainly from emerald ash borer. Construction crews are also in and out of the inn. Jeremiah Heierman, property manager, asked the public to not enter the building for their own safety. To make a reservation for an event this summer call (574) 457-7100 or (855) 929-2733. Older PostOakwood Inn Open This Season?